Not last year, technically, but in March of 2018, I gave Tim a gift card for Wild Birds Unlimited because we'd been talking about getting a feeder for our garden. Finally, this past Saturday, we went out and chose one. That's almost last year, isn't it? We've been watching House Finches and Sparrows flitting about the feeder and emptying it at a tremendous rate. There's plenty of other food around at this time of year, so we'll be cutting back on how often we fill it. They still come around on their foraging route and we'll give them more food come winter. where we live, so close to the ocean. While walking with a friend this morning, we both commented on how lovely the sea smells, invigorating and fresh. I don't have a cat, but there's a black one in the neighbourhood that sneaks through the hedge whenever I'm working in the garden. She has a bell to let birds know she's coming. So many birds are killed by outdoor cats. I'm on the birds' side. If I had a cat, I'm sure she would enjoy the deck as much as I do - it's a lovely place for afternoon or morning tea. I'm longing for hopes to be fulfilled. With much less intensity, I'm longing for my dahlias to begin blooming. I planted them late and they are just forming buds now. I watch them every day to see how they are coming along. In the meantime, the hydrangeas and sunflowers are providing material to fill the vases. Real life is sweet summer peaches, juicy warm freshly picked tomatoes, cool mornings that transform into hot afternoons, weeds that grow faster than anything else, and roses that keep on blooming. Are you looking forward to the end of summer, or hanging onto it as long as possible? Unfortunately the sea here does not smell fresh and invigorating. I'm ready for summer to be over so that daytime temps will be much more bearable. The high today is going to be 115 F.
I love the smell of the sea too! Actually I enjoy many scents in nature but the sea is number for my hubby. He grew up next to the north shore so whenever there is water close by, he feels completely invigorated. It always reminds him of when he was a boy. We have one feeder and we feed those little darlings all year round because it gives me great joy just to watch them. I especially love the gold finches. There's nothing quite like tomatoes off the vine! Love them! Your tea things are lovely and it looks like you have the perfect spot to enjoy a cuppa. Have a beautiful weekend, Lorrie. Lovely photos. The scent of ocean air is one of the top best smells. Peaches yes! I'm looking forward to making homemade peach ice cream. I feel that we are on the edge of Autumn here. Things are creeping to an end, vegetables, flowering plants, and trees are just beginning to drop some of their leaves. All too soon. What a pretty quilt on your deck. Wish we could have a bird feeder here in the NC mountains. We tried one and on Christmas Eve a bear destroyed it. We thought the bears would be hibernating. I am hanging onto summer for as long as I can! I love the ocean, but either in the morning or early evenings. I hope your dahlias bloom! I must say I am longing for autumn. We’ve had a hot and humid summer, which I don’t love, and I can’t wait to spend time outdoors again! We hang on to summer a lot longer than most. But it will be nice when it cools enough to get back on the trails. I miss bird watching and critter finding! 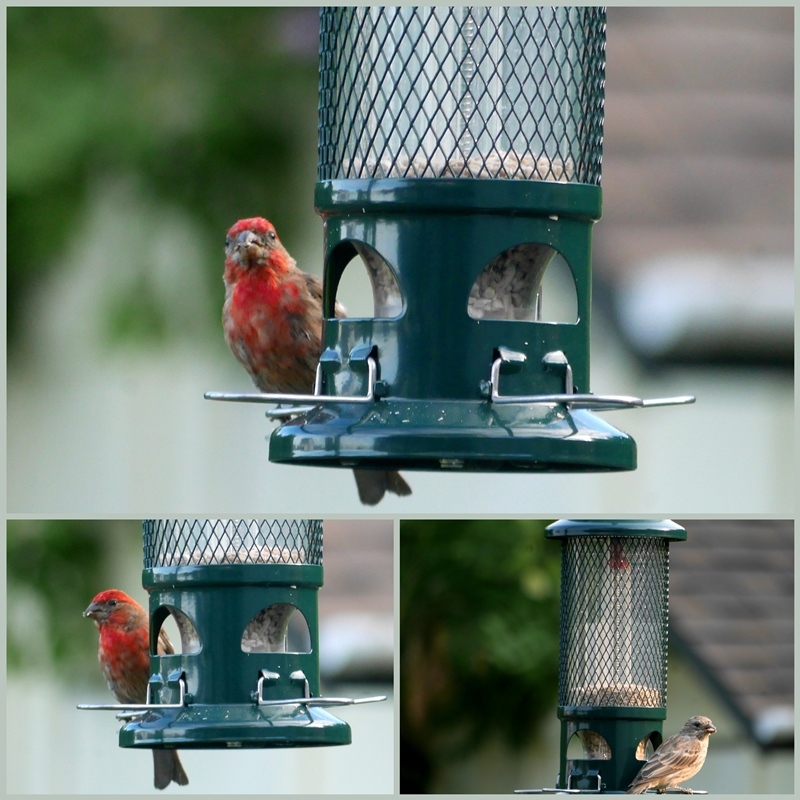 But we have some sweet finches at our feeders too. These feeders last a long time and help keep the squirrels out. We got ours at WBU too...long long ago! Lots of things to read between the lines... Oh I am hanging on for dear life even if September and October are my favorite months. Mmmm... those peaches look delicious!! We have a bird feeder in the backyard, and the birds provide lots of entertainment! I have never said this before because I do like summer, but I am looking forward to the heat and smoke being gone. Cooler weather will be welcomed here. Yummm, peaches!! Love the bird feeder. We love watching the birds come to our feeder. Lovely teatime too. I would love sipping tea on that porch. Your cozy porch is perfect for tea time! It goes without saying that I love your pretty tea set. I'm also going through a peach phase--that's the theme of my upcoming post! While I'm enjoying the more relaxing pace of summer, I'm looking forward to the cooler temperatures and pumpkin season. I'm hanging on to summer in spite of our heat. It was an unusual summer and I feel like I had little time to just enjoy it. But I noticed this weekend some leaves starting to turn, and many more to sweep up. So fall has peeked around the corner. Looks like a great bird feeder! Enjoyed scrolling through. Just realized I haven't had any fresh peaches yet this summer. A fresh peach pie sounds real good. I'm not the biggest fan of summer and this summer in particular has been a little rough so I am looking forward to the next season. I'll still enjoy what's left, though. Well both! I adore summer. But it is so dang hot. I love the fall for the warm days and cool nights. Lorrie, what lovely photographs! A walk along the shore must be so refreshing. Your garden pictures look so serene and I am drooling over the peaches! I am enjoying the last days of summer but am excited about autumn's upcoming appearance. Lorrie, I am not a fan of summer. In fact, you mentioned about the only things I like about summer--peaches (and other summer fruit), "real" tomatoes, and roses. Roll on, autumn! Ooh … I can almost feel the peach fuzz against my cheek, and the juiciness running down my chin … Yummy! I am glad the cat has a bell - outdoor cats kill millions of birds every year. I am clinging to summer - so much more that I would like to do before the days shorten and the snowflakes fly! Enjoy your week ahead.